The modern Olympic Games began in Athens in 1896 when fourteen nations competed in forty-three events in nine sports. Only men competed in the first games. It was four years later when women were allowed to compete in a small number of events. There was no Limerick participant in the first games. Prior to 1924 Ireland did not compete as an independent country so participants competed under the flags of other countries, with the majority competing for Great Britain. Even after Ireland held a flag at the games many Limerick born competitors still chose to participate for their adopted counties. John Flanagan (1873-1938), born in Kilbreedy, represented America in the 1900 Olympics in Paris, winning gold in the hammer throw for this and the following two Olympic games. This accomplishment included setting two new world records; first in the 1904 St Louis games, a record he broke four years later in 1908 London. The Leahy family from Cregan, near Charleville, had not just one but two Olympic medalists. First Patrick (1877-1927) who took home silver in the high jump and bronze in the long jump at the Paris 1900 games. Then four years later his brother, Con (1876-1921), came joint second in the high jump. Both brothers left Ireland for the United States in 1909. At the 1908 games Limerick men gained another two medals. First, Tim Ahearne (1885-1968), who was born in Athea. He received gold in the triple jump, also known as the ‘hop, skip and jump’. He also competed, but did not medal, in the hurdles. Second, William Russell Lane-Joynt (1855-1921), a barrister and the son of a Limerick Mayor, gained the silver in ‘running deer shooting’. Both of these Limerick born Olympic winners competed under the British flag. Denis Carey (1872-1947), born in Kilfinane, and a cousin of John Flanagan, participated in the hammer throw for Britain. He placed sixth in 1912 Stolkholm. When not competing, he worked as a member of Dublin Metropolitan Police. 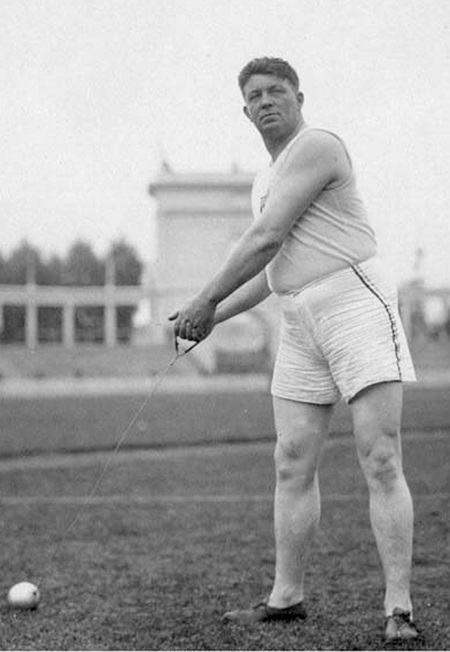 Patrick James Ryan (1881-1965), born in Old Pallas, competed for the United States in 1920 Antwerp and won gold in the hammer throw and silver in the 56 pound weight throw. He was a member of The Irish Whales or “The Whales”, which was a nickname given to a group of Irish and Irish-American athletes who dominated weight-throwing events in the first two decades of the 20th century. Also representing Limerick under the flag of the United States in 1920 was Dan Ahearn(e) (1888-1942), the younger brother of Tim Ahearne, who had competed twelve years earlier. The inaugural flag bearer representing Ireland as an independent participating country in 1924 Paris was John O’Grady (1891-1934), born in Ballybricken. He participated in the shot put, which he threw a distance of 12.75 metres, placing him seventeenth. There is a large monument to this achievement on the Ballysimon Road outside the Munster Fair Tavern. Denis Cussen (1901-1980) became a qualified doctor in 1925 and had his first appointment in St Mary’s Hospital in London. He later represented Ireland in 1928 Amsterdam. He won his heat of the 100m and came fifth in the quarter final heat. Many years later Cussen returned to the Olympics as the Medical Officer to the British team in Melbourne 1956. James Hogan (1933-2015), born in Croom, ran in the 10,000m and the marathon for Ireland in Tokyo 1964 and ran it again for Great Britain four years later in 1968 Mexico. Neil Cusack (1951), the only Irish man to win the Boston City Marathon , competed in two Olympics. First, he took part in the 10,000m in 1972 Munich and then marathon in 1976 Montreal, placing fifty-fifth. Cusack was joined by Niall O’Shaugnessy (1955-2015) in Montreal, who took part in the 800m and 1500m track. Michael O’Shea ran the 5,000m in 1980 Moscow where he ranked tenth. Frank O’Mara, formally educated at St Munchin’s College, competed in three Olympic Games; Los Angeles 1984, Seoul 1988 and Barcelona 1992. Gerard Mullins participated in the Equestrianism section of the Olympics riding Rockbarton in 1984 Los Angeles and Glendalough in 1988 Seoul. Also at Seoul was Barbara Johnson who competed in the 400m hurdles. Tom Comyns at the Sydney Olympics in 2000 as part of the Irish 4×100-metre relay team. While Rosemary Ryan of Bilboa A.C. ran the 5,000m. Though Andy Lee was born in England, he was raised in Castleconnell, and was made an honorary Limerick man when he competed in boxing at the 2004 Athens games. Sean O’Neill rowed for Ireland in 2008 Beijing and for his adopted home of New Zealand in 2012 London. In total ten medals were won at the Olympic Games by Limerick men and women. This year the Olympics will be held in Rio de Janeiro with Limerick born swimmer Fiona Doyle taking part in the 100m breaststroke. Rower Sinead Jennings has also been nominated to take part in the Lightweight Women’s Double Scull. Though she was born in Donegal, she has made Limerick her home and rows with St Michael’s Rowing Club in the heart of the city. Sinead’s husband, Sam Lynch, was born in Limerick and rowed at both 1996 Atlanta and 2004 Athens. The article was first published in the August issue of The Limerick Magazine.